Aged 14–18 on 1 September 2018? Want to take part in an inspiring day of music making? 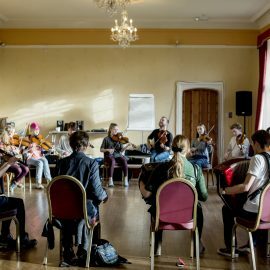 Sign up for a free place at one of the Sampler Days across England with the National Youth Folk Ensemble. Explore English folk music, learn from inspiring tutors and play with other young musicians from the area. Take part in a day of creative folk music workshops and, if you want to, audition for the 2018–19 National Youth Folk Ensemble. The tutors will include Sam Sweeney, Artistic Director of the Ensemble and BBC Radio 2 Folk Musician of the Year 2015. Promoted by the English Folk Dance and Song Society with funding from Arts Council England.